The Finnish Gothic Rock-Metal band is back! 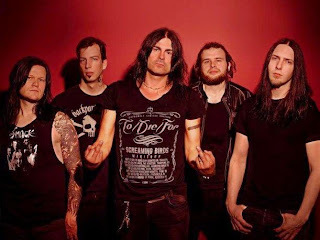 To / Die / For just premiere their new video "In Black", the second single from their seventh studio album CULT which will be released on June 26, 2015. The video was recorded in Helsinki (Finland), being produced by Junkyard Films and directed by Roy Unho. The video features the special participation of all finalist models of the contest "Miss Rock 2015". The song was recorded, mixed and mastered by Juho Räihä of Soundspiral Studio in Kouvola-Finland, hometown of the band. The new seventh full-length album of the band was recorded, mixed and mastered between April and May 2015 and will be released in the European and South American markets on June 26 via Massacre Records and Dynamo Records, respectively. CULT contains song titled "Unknown III", a posthumous tribute to Tonmi Lillman, drummer highlight that took To / Die / For, who died on February 13, 2012. Similarly, we find a version of "Straight Up" song originally performed by the famous choreographer and singer Paula Abdul. Jape Perätalo, lead singer and main songwriter of the band, stated: "With CULT we return to our roots. In our previous album 'Samsara' experimented a lot with our sound and influences, now it's time to return to the melancholy, heavy riffs and dark that characterized us in our beginnings, CULT be the most melancholy and dark album that has made To / Die / For in its history. We hope that the launch of long-awaited CULT call our first big tour in Latin America, we will wait for us for you! " To / Die / For is unveiled to the world in 1999 with their debut album "All Eternity" and after six studio albums, lineup changes and a short break, it is one of the few bands of its kind that has managed to remain in force until today (many of his contemporaries or are missing or sought new musical directions). Today the band is formed by the founders and Juppe Sutela Perätalo Jape, That Viren, Matti Huopainen and the newly integrated bassist Samuel Schildt. In early 2014, the band announced its alliance with the Peruvian agency Eternal Symphony Entertainment for the efforts of representation, management and booking in the territory of Latin America. It is expected that the first major Latin American tour of the band is carried out in late 2015, visiting Mexico again and for the first time, Central and South America.